February 1.--ST. BRIDGID, Abbess, and Patroness of Ireland. NEXT to the glorious St. Patrick, St. Bridgid, whom we may consider his spiritual daughter in Christ, has ever been held in singular veneration in Ireland. She was born about the year 453, at Fochard in Ulster. During her infancy, her pious father saw in a vision men clothed in white garments pouring a sacred unguent on her head, thus prefiguring her future sanctity. While yet very young, Bridgid consecrated her life to God, bestowed everything at her disposal on the poor, and was the edification of all who knew her. She was very beautiful, and fearing that efforts might be made to induce her to break the vow by which she had bound herself to God, and to bestow her hand on one of her many suitors, she prayed that she might become ugly and deformed. Her prayer was heard, for her eye became swollen, and her whole countenance so changed that she was allowed to follow her vocation in peace, and marriage with her was no more thought of. When about twenty years old, our Saint made known to St. Mel, the nephew and disciple of St. Patrick, her intention to live only to Jesus Christ, and he consented to receive her sacred vows. On the appointed day the solemn ceremony of her profession was performed after the manner introduced by St. Patrick, the bishop offering up many prayers, and investing Bridgid with a snow-white habit, and a cloak of the same color. While she bowed her head on this occasion to receive the veil, a miracle of a singularly striking and impressive nature occurred: that part of the wooden platform adjoining the altar on which she knelt recovered its original vitality, and put on all its former verdure, retaining it for a long time after. At the same moment Bridgid's eye was healed, and she became as beautiful and as lovely as ever. Encouraged by her example, several other ladies made their vows with her, and in compliance with the wish of the parents of her new associates, the Saint agreed to found a religious residence for herself and them in the vicinity. A convenient site having been fixed upon by the bishop, a convent, the first in Ireland, was erected upon it; and in obedience to the prelate Bridgid assumed the superiority. Her reputation for sanctity became greater every day; and in proportion as it was diffused throughout the country the number of candidates for admission into the new monastery increased. The bishops of Ireland, soon perceiving the important advantages which their respective dioceses would derive from similar foundations, persuaded the young and saintly abbess to visit different parts of the kingdom, and, as an opportunity offered, introduce into each one the establishment of her institute. While thus engaged in a portion of the province of Connaught, a deputation arrived from Leinster to solicit the Saint to take up her residence in that territory; but the motives which they urged were human, and such could have no weight with Bridgid. It was only the prospect of the many spiritual advantages that would result from compliance with the request that induced her to accede, as she did, to the wishes of those who had petitioned her. Taking with her a number of her spiritual daughters, our Saint journeyed to Leinster, where they were received with many demonstrations of respect and joy. The site on which Kildare now stands appearing to be well adapted for a religious institute, there the Saint and her companions took up their abode. To the place appropriated for the new foundation some lands were annexed, the fruits of which were assigned to the little establishment. This donation indeed contributed to supply the wants of the community, but still the pious sisterhood principally depended for their maintenance on the liberality of their benefactors. Bridgid contrived, however, out of their small means to relieve the poor of the vicinity very considerably; and when the wants of these indigent persons surpassed her slender finances, she hesitated not to sacrifice for them the movables of the convent. On one occasion our Saint, imitating the burning charity of St. Ambrose and other great servants of God, sold some of the sacred vestments that she might procure the means of relieving their necessities. She was so humble that she sometimes attended the cattle on the land which belonged to her monastery. The renown of Bridgid's unbounded charity drew multitudes of the poor to Kildare; the fame of her piety attracted thither many persons anxious to solicit her prayers or to profit by her holy example. In course of time the number of these so much increased that it became necessary to provide accommodation for them in the neighborhood of the new monastery, and thus was laid the foundation and origin of the town of Kildare. The spiritual exigencies of her community, and of those numerous strangers who resorted to the vicinity, having suggested to our Saint the expediency of having the locality erected into an episcopal see, she represented it to the prelates, to whom the consideration of it rightly belonged. Deeming the proposal just and useful, Conlath, a recluse of eminent sanctity, illustrious by the great things which God had granted to his prayers, was, at Bridgid's desire, chosen the first bishop of the newly erected diocese. In process of time it became the ecclesiastical metropolis of the province to which it belonged, probably in consequence of the general desire to honor the place in which St. Bridgid had so long dwelt. After seventy years devoted to the practice of the most sublime virtues, corporal infirmities admonished our Saint that the time of her dissolution was nigh. It was now half a century since, by her holy vows, she had irrevocably consecrated herself to God, and during that period great results had been attained; her holy institute having widely diffused itself throughout the Green Isle, and greatly advanced the cause of religion in the various districts in which it was established. Like a river of peace, its progress was steady and silent; it fertilized every region fortunate enough to receive its waters, and caused it to put forth spiritual flowers and fruits with all the sweet perfume of evangelical fragrance. The remembrance of the glory she had procured to the Most High, as well as the services rendered to dear souls ransomed by the precious blood of her divine Spouse, cheered and consoled Bridgid in the infirmities inseparable from old age. 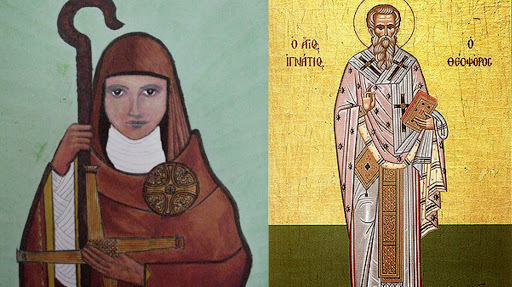 Her last illness was soothed by the presence of Nennidh, a priest of eminent sanctity, over whose youth she had watched with pious solicitude, and who was indebted to her prayers and instructions for his great proficiency in sublime perfection. The day on which our abbess was to terminate her course, February 1, 523, having arrived, she received from the hands of this saintly priest the blessed body and blood of her Lord in the divine Eucharist, and, as it would seem, immediately after her spirit passed forth, and went to possess Him in that heavenly country where He is seen face to face and enjoyed without danger of ever losing Him. Her body was interred in the church adjoining her convent, but was some time after exhumed, and deposited in a splendid shrine near the high altar. Reflection.--Outward resemblance to Our Lady was St. Bridgid's peculiar privilege; but all are bound to grow like her in interior purity of heart. This grace St. Bridgid has obtained in a wonderful degree for the daughters of her native land, and will never fail to procure for all her devout clients. February 1.--ST. IGNATIUS, Bishop, Martyr. ST. IGNATIUS, Bishop of Antioch, was the disciple of St. John. When Domitian persecuted the Church, St. Ignatius obtained peace for his own flock by fasting and prayer. But for his part he desired to suffer with Christ, and to prove himself a perfect disciple. In the year 107, Trajan came to Antioch, and forced the Christians to choose between apostasy and death. "Who art thou, poor devil," the emperor said when Ignatius was brought before him, "who settest our commands at naught?" "Call not him 'poor devil,'" Ignatius answered, "who bears God within him." And when the emperor questioned him about his meaning, Ignatius explained that he bore in his heart Christ crucified for his sake. Thereupon the emperor condemned him to be torn to pieces by wild beasts at Rome. St. Ignatius thanked God, Who had so honored him, "binding him in the chains of Paul, His apostle." Reflection.--Ask St. Ignatius to obtain for you the grace of profiting by all you have to suffer, and rejoicing in it as a means of likeness to your crucified Redeemer.